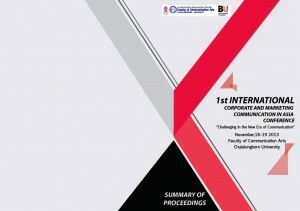 The Proceedings of the pioneering 1st International Corporate and Marketing Communication in Asia Conference (ICMCAC) in Bangkok, held on November 18-19, 2013, have been published. View the proceedings online here. The FIF-assisted conference was very successful and attracted more than 30 papers from 10 countries. “I hope authors will share the link to the Proceedings with colleagues and use papers for teaching, engagement with practitioners and as a basis for further research,” commented Professor Tom Watson of the Media School. He is co-chairman of the conference with Associate Professor Jirayudh (Jay) Sinthuphan of Chulalongkorn University. Among papers presented was one from Dr Ana Adi (Media School) and Nathaniel Hobby (M&C) on digital marketing of HE courses in Asia. Professor Watson was one of two keynote speakers at the 2013 conference. The 2nd ICMCAC has dates of November 15-16, 2014 pencilled in and will be held again at Chulalongkorn University’s Faculty of Communication Arts in central Bangkok.. The 2014 Call for Papers is being developed and will be posted shortly. BU and Chulalongkorn University have recently signed an Memorandum of Understanding (MOU). In addition to the conference and forthcoming British Council-sponsored Researcher Links Workshops, there is joint research into CSR practices. It is being led by Dr Tasos Theofilou and Dr Georgiana Grigore of the Media School’s Corporate & Marketing Communications academic group, with support on local data collection in Thailand from Professor Parichart Sthapitanonda and James Haft of Chulalongkorn University.